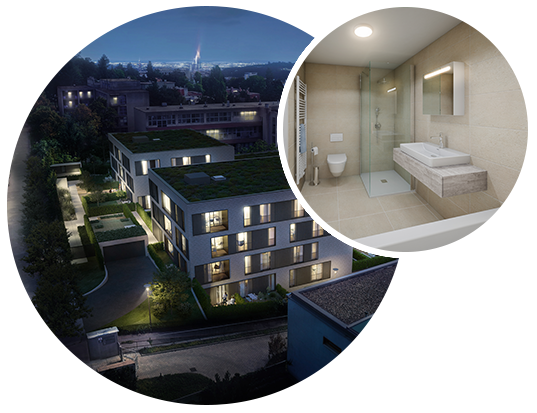 Neumanka apartment buildings are environmentally and economically friendly. In terms of rating as an energy efficient building, the building as a whole meets the standard B. Lower energy costs are ensured by the high quality thermal insulation of the construction and the building materials used. All walls and partitions are built using Kalksandstein sand-lime bricks, used in the construction of passive and energy efficient houses. Kalksandstein bricks are also known for their sound proofing and thermoregulatory properties. Large-format wooden windows with triple glazing provide insulating and soundproofing properties. The orientation of the building also contributes to savings. The southern slope offers a great view of Pisárky and provides plenty of sunlight.